Dermal fillers are substances that are used to enhance or replace volume that has been lost in the skin over time. 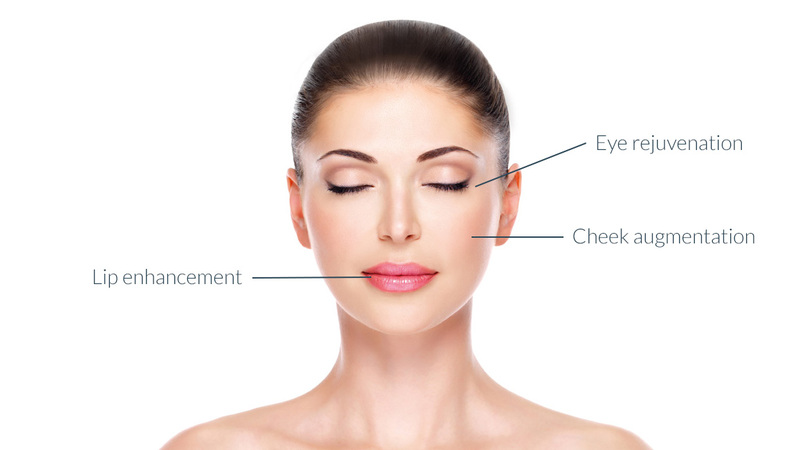 It is a popular facial rejuvenation technique and can be used to enhance cheekbones, plump up the lips or smooth the contour of an uneven nose. It can further be used to correct scarring, wrinkles, and other skin depressions. It can be used as a stand alone treatment or combined with other injectables such as anti-wrinkle injections for a greater final result. Dermal fillers provide instant results with little to no downtimes. It is a simple, safe and effective treatment when used and administered by a properly trained physician. They are minimally invasive, meaning there is little or no down time. They have a variety of uses, from reducing volume or enhancement of specific areas of the face. They are safe, have been tested over the years, and are proven to be effective. The vast majority of patients experience no complications. Results last up to 12-24 months depending on the area treated. Lip enhancement is a cosmetic procedure that is aimed at improving the appearance of the lips by increasing their plumpness or changing their shape. Lips can decrease in size due to ageing or you may have been genetically inherited thin lips. The smile constitutes a major feature of facial beauty and lip enhancement helps to achieve natural, balanced results that provide definition to your face. They can add volume to thinning lips, enhance shallow contours, help reverse a downward smile, and smooth out vertical lines on your lips also known as smoker’s lines. The whole procedure takes approximately 45 minutes. A thorough consultation is undertaken where your goals and expectations are discussed. The best possible treatment plan will be discussed with you. A numbing cream will be placed on and around your lips for your comfort. After you’ve been injected with lip fillers, your new plump and full lips will be immediately apparent. There may be mild swelling and temporary numbness, which is temporary and can be controlled with an ice-pack. You can resume your normal activities right after treatment. As we age, the fat that gives our cheeks there fullness and healthy peachy look, becomes depleted, resulting in sagging, flat cheeks and dropping facial skin. This results in an aged face. Dermal fillers for cheek augmentation help to correct age-related volume loss by restoring volume in the cheeks. It further provides a subtle lift across the midface and decreases the look of nasolabial folds. The product used has been tested for safety and efficacy and is a safe treatment when administered by an experienced physician. It contains a local anaesthetic for your comfort. Results are seen instantly, with mild swelling that persists for approximately one week. Dermal fillers used for the cheeks last between 18-24 months. Dermal fillers can be used to rejuvenate the eye area. Common conditions that can be treated using dermal fillers include; Hollows under the eyes and and dark circles under the eyes. In treating Hollows under the eyes; dermal fillers are used to ‘fill’ the hollow creating a smooth under eye appearance. Results can last up to 12 months. In treating dark circles under the eyes; dermal fillers help to reduce their appearance by providing hydration to the area as well as stretch the skin.